Cobblestone streets, lush parks, historic buildings and Victorian homes with charming front porches make Savannah feel like a movie set that’s come to life. This is the place to come whether you're a Civil War buff or you love the art scene. If you’re planning a holiday to this dramatic city, finding the perfect place to stay should be your first priority. In a city that’s known for breathtaking homes, it takes a lot for one property to stand out among Savannah vacation rentals. However, you’re about to discover a home that takes the cake. Charming doesn’t even begin to describe the Southern Belle. This stunning gated home integrates modern living and timeless beauty like no other home you’ve ever stepped foot in. It should come as no surprise that this magnificent property is one of the most desirable Savannah vacation rentals available. Every detail of this home has been updated to create a fresh, pristine atmosphere. Its location in the Savannah Historic District makes it a dreamy place to stay if you’re eager to explore all of the history, beauty and romance that this iconic city has to offer. The home’s kitchen is certain to become your favorite room to spend time in during your holiday. This bright, open kitchen has white cabinetry and glowing marble counters. You’ll love staring out a large window as you stand at the kitchen’s farmhouse sink to rinse dishes. A horseshoe-shaped layout ensures that you can keep a conversation with guests at the dining table as you whip up a Southern meal to remember. In addition, seated counters offer plenty of room for friends or family to gather around as you tend to business in the kitchen. Stunning wood floors throughout the home add a touch of country that will make you feel cozy. The home’s living room is the perfect place to relax after a day of sightseeing around Savannah. The room’s large windows allow for plenty of light to come in. Of course, the most beautiful feature of the Southern Belle won’t be revealed to you until you step foot outside your door. 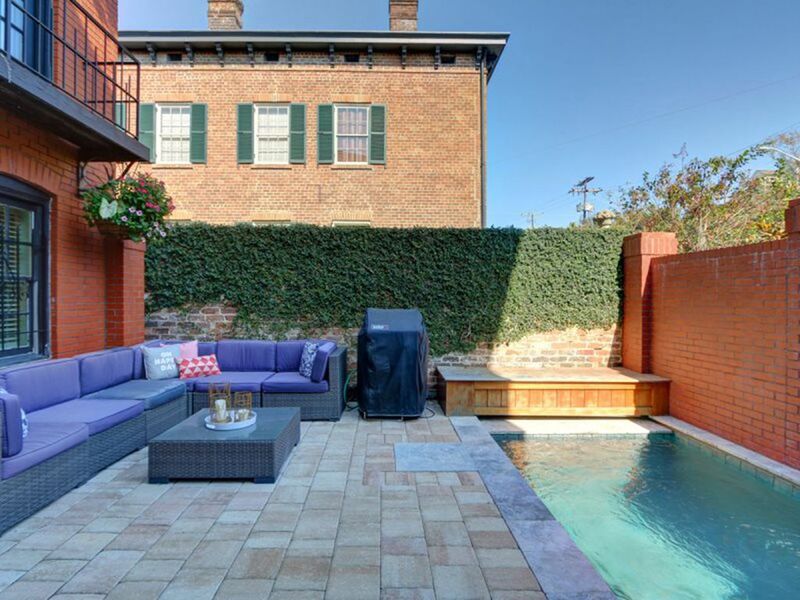 The property features a beautiful brick courtyard with comfortable seating for your outdoor enjoyment. The home has flat-screen televisions to offer you supreme entertainment options. The bedrooms in this beautiful home were made for sweet dreams. You’ll feel right at home when you rest for the night in one of two polished, comfortable rooms. In addition, the second floor features a large bathroom with a tub and shower. The home features two full bathrooms and one half bathroom in total. If you’re looking for a sweet Southern getaway, make the Peach State feel like you're home away from home by staying in one of the vacation homes Savannah visitors can truly feel cozy in. It doesn’t get much better than the Historic District when you’re looking for incredible places to stay while visiting Savannah. All the special landmarks and amazing parks that make Georgia vacations so memorable will be right at your fingertips when you make this neighborhood your home for a few nights. Some of the popular landmarks that are just a few steps away from the Southern Belle include the Green-Meldrim Home, Chippewa Square, Forsyth Park and the Juliette Gordon Low Birthplace. Any savvy traveler will tell you that Georgia vacations just aren't complete if they don't include Savannah. The city is home to 22 historic squares that rival anything you'll find in Europe's iconic cities. The city's rich history also speaks through its historic cemeteries. The graves at well-known attractions like Colonial Park Cemetery, Bonaventure Cemetery and Laurel Grove Cemetery serve as the final resting places for English settlers, Confederate soldiers and African American slaves. In addition to popular landmarks right near the Historic District, you'll be able to easily get to Wormsloe Plantation and the Telfair Museum of Art. Of course, Abercorn Common, Oglethorpe Mall and Abercorn Walk are the best shopping centers in the city. Of all the vacation homes Savannah tourists have to choose from, none can set the mood for history, relaxation and adventure quite like the Southern Belle can. The unique culture of Savannah has been immortalized in popular films and books for decades. However, the true magic of this city can’t be experienced unless you live, eat and play like a local for at least a few days. The Southern Belle is one of those vacation homes Savannah residents can’t help but to look at with envy every time they pass by it. You will definitely earn the admiration of locals when you tell them you’re staying in this exceptional home. In a place where one home is more beautiful than the next, this rich jewel of a property truly stands out among all of the other Savannah vacation rentals. Southern Belle Vacation Rentals is a full service property management company dedicated to providing clients with great places to stay and friendly service. We’re here to help and give advice on just about anything. Southern Belle Vacation Rentals is owned and operated by Summer and Walt Freeman who have combined their skills and grown Southern Belle into a thriving rental business. Our philosophy is to provide great service, desirable homes, and an overall “can do” attitude to guests and homeowners. To continue having a strong reputation for listening to our customers and exceeding their expectations, again and again. To ease stress by making trips as perfect as possible. Just bring a suitcase, a smile, and let us do the rest! We went to Savannah to celebrate my husband’s 65th birthday. He likes to have more space than a hotel room and this worked perfect. Beds were very comfortable. His only complaint was that he had to go up stairs to get to the main floor (kitchen and den) and then up more stairs for the bedroom. He was prepared for one set but not two. It worked out though and we would stay there again!